Occupy Wall Street | NYC Protest for World Revolution: "On November 20, Wet’suwet’en Hereditary Chief Toghestiy intercepted and issued an eagle feather to surveyors from the Can-Am Geomatics company, working for Apache’s proposed shale gas Pacific Trails Pipeline. 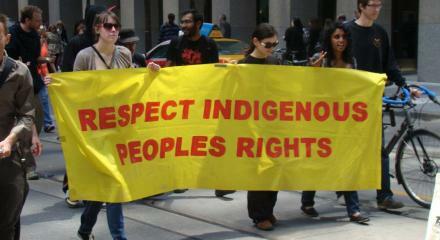 In Wet’suwet’en law, an eagle feather is used as a first and only notice of trespass. The surveyors were ordered to leave the territory and the road entering into the territory has been closed to all industry activities until further notice. 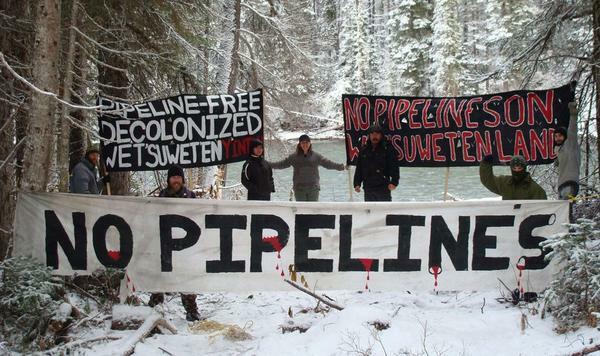 Since July of 2010, the Wet’suwet’en have established a camp in the pathway of the Pacific Trails Pipeline. Likhts’amisyu hereditary chief Toghestiy states, “Unist’ot’en and Grassroots Wet’suwet’en have consistently stated that they will not allow such a pipeline to pass through their territory. The federal and provincial governments, as well as Indian Act tribal councils or bands, have no right or jurisdiction to approve development on Unist’ot’en lands. By consulting only with elected Indian Act tribal councils and bands, the Canadian government breaks its own laws as outlined in the 1997 Supreme Court of Canada Delgamuukw decision which recognizes Hereditary adjudication processes.”"